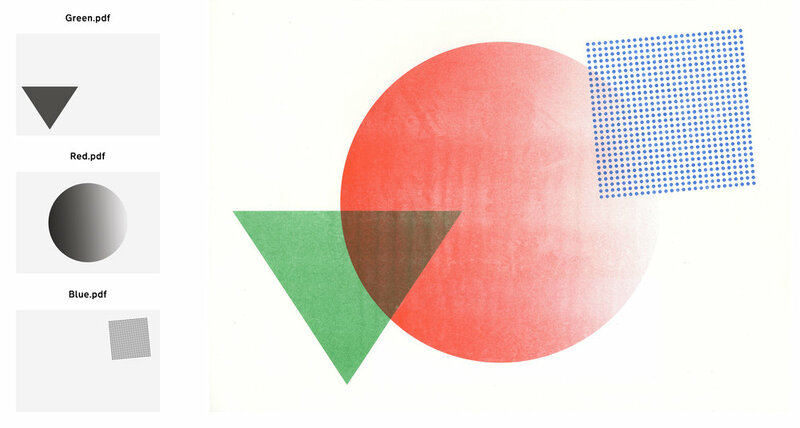 Risograph Guide — Dizzy Ink. We specialise in a range of print processes; Risograph, screen-printing and Mimeograph. We use these techniques as our platform to develop creative projects. Risograph is a unique method of printing which bridges the gap between analogue and digital production. Unique soy based ink range; exceptionally vibrant and tactile. Extremely energy efficient with minimal waste. The machine is loaded with the appropriate ink drum, corresponding to the artwork. Artwork is then sent to the printer either through the flatbed scanner (like a photocopier) or via a computer. The printer then burns the artwork onto a stencil which is wrapped round the drum and ink can then pass through. Risograph inks are translucent, meaning that they are affected by what they print onto. If inks are printed onto a coloured paper stock for example they will take on certain characteristics of the paper. The same thing happens when two inks overlap each other- they mix. CMYK inks are not made in Riso meaning we are able to use our own colours to replace the norm. The prints to your right are an example of each colour we use when printing our version of CMYK. We have collected 5 different Risograph machines, all with their different specialities. 17 Colours and rising! Contact us for an up to date list! We stock specialist ink colours such as Metallic Gold, Fluorescent Orange and Aqua. We have two double drum Risograph printers, allowing us to print with more accuracy.